FILE - In this March 2, 2016, photo provided by NASA, International Space Station crew member Scott Kelly of the U.S. reacts after landing near the town of Dzhezkazgan, Kazakhstan. Nearly a year in space put astronaut Scott Kelly's immune system on high alert and changed the activity of some of his genes compared with those of his Earth-bound identical twin, researchers said Friday. Scientists don't know if the changes were good or bad, but results from a unique NASA twins study are raising new questions for doctors as the space agency aims to send people to Mars. Tests of the genetic doubles gave scientists an opportunity, not available before, to track details of human biology, such as how an astronaut's genes turn on and off in space differently than at home. One puzzling change announced Friday at a science conference: Kelly's immune system was hyperactivated. "It's as if the body is reacting to this alien environment," somewhat like the way a body would react with "a mysterious organism" inside, said geneticist Christopher Mason of New York's Weill Cornell Medical College, who helped lead the study. He said doctors were now looking for that in other astronauts. 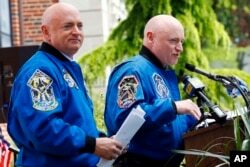 FILE - Retired astronaut Scott Kelly, right, speaks while standing next to his astronaut twin brother, Mark Kelly, during an event renaming the elementary school they attended, May 19, 2016, in West Orange, N.J. The good news: Almost everything returned to normal shortly after Kelly got back on Earth in March 2016. Those immune-related genes, however, "seemed to have this memory or this need to almost be on high alert" even six months later, Mason said. "On the whole it's encouraging," said Craig Kundrot, who heads space life and science research for NASA. "There are no major new warning signs. We are seeing changes that we didn't necessarily anticipate," but they don't know if those changes are consequential. Ultimately, the twins study gives NASA a catalog of things to monitor on future missions to see if other astronauts react the same way. Astronauts on future missions will be able to do some of this testing in space instead of freezing samples for scientists back home, Mason said. 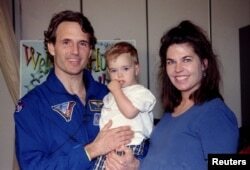 FILE - Space shuttle Atlantis astronaut Jerry Linenger poses with his family following an interview, after returning to Earth May 24, 1997. Linenger spent 122 days on the Russian Mir space station. Immune issues sound familiar to Dr. Jerry Linenger, an American astronaut who spent more than four months on the Russian space station Mir. He said he was never sick in orbit, but once he came back to Earth, "I was probably more sick than I was in my life." Astronauts launch into orbit with their own germs and get exposed to their crewmates' germs, and then after a week with nothing else new in the "very sterile environment" of a space station, "your immune system is really not challenged," Linenger said. A human mission to Mars, which NASA hopes to launch in the 2030s, will take 30 months, including time on the surface, Kundrot said. On Earth and even on the space station, Earth's magnetic field shields astronauts from lots of radiation. There would be no such shielding on the way to Mars and back, but tunnels or dirt-covered habitats could help a bit on Mars, Kundrot said.